Jackson Hole Mountain Resort, located in western Wyoming’s Teton Village, is situated just 15 miles from the Jackson Hole Airport and Grand Teton National Park. 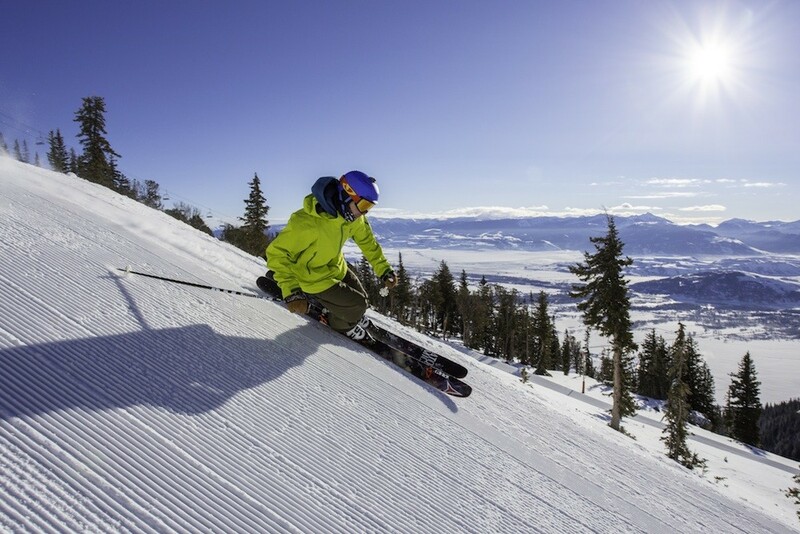 Featuring two mountains, Apres Vous and Rendezvous, Jackson Hole Mountain Resort is known for steep skiing and gorgeous scenery and is home to 2,500 acres of skiable terrain and 4,139 feet of vertical drop. The ski resort receives an average of 459 inches of snowfall each year and boasts a summit elevation of 10,450 feet. The Wyoming ski area may be notorious for extreme terrain like Corbet’s Couloir, but Jackson Hole also caters to intermediate and beginner skiers with groomed terrain accessed off The Teton Lift. There’s no shortage of Jackson Hole hotels, with slopeside lodging options that include the Four Seasons Resort and Residences, Teton Mountain Lodge & Spa and the Snake River Lodge & Spa. A variety of vacation rentals, condos and cabins are also available throughout Teton Village. These signs aren’t being overly dramatic. Even the most skilled skiers can find themselves in trouble around JHMR’s 2,500 acres. The named runs are well marked though, so most often you have to go looking for trouble. You also have to look hard to find lift lines. Not counting the tram on a powder morning, a long line at JHMR is 5 minutes. Starting just below the existing Thunder Lift, Marmot lift rises 1,200 feet across Rendezvous Mountain to the top of the Bridger Gondola. Formerly, the only way to get from Thunder to the Gondola was to ski all the way down to the base area and then take the gondola up. The Marmot lift not only shines when you’re starving at the base of Thunder, but also during early and late season. It’ll let you stay most all day at mid- and upper-elevations. 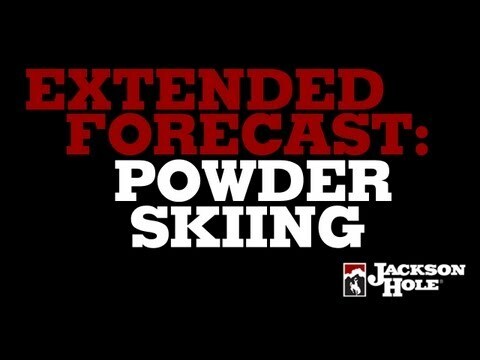 People joke that a “powder day” at JHMR is more a “powder hour.” Locals here are hard-charging and can track out the area fast. In 1999, when JHMR opened the gates to lift-accessed backcountry, it was one of only a very few resorts to allow skiers and snowboarders to exit in-bounds terrain. The Headwall and Casper Bowl are inbounds but still require a 20-minute hike from the top of the Bridger Gondola. If hiking isn't your thing, Saratoga Bowl and Moran Woods, off Apres Vous and Casper, respectively, aren’t as steep or as long as the Hobacks (off the Sublette Quad), but, because of that, do usually offer fresh tracks for longer. The trees to either side of Pepi’s Ridge (Sublette Quad) can hold powder for a while, too. If you have the necessary backcountry gear—transceiver, shovel, probe—and skills, go ahead and aim for some true backcountry. Rock Springs and Cody Bowl, both just south of the resort boundaries and accessed through marked gates, are good starters, albeit fairly easy to get to, so fresh powder doesn’t last long there. Backcountry runs in Granite Canyon, to the north of the resort in Grand Teton National Park and accessed from the top of the tram or the Apres Vous lift, are more committing. They require route finding skills, or better yet, someone who knows the area and is willing to let you follow them. Know that even though you don’t need climbing skins to get out of Granite Canyon, they’re never a bad thing to have in your backcountry pack in case you do get lost. The way back to the resort from Granite Canyon is a traverse, but not completely downhill. Expect to expend some serious energy before popping out near the bottom of the Apres Vous lift. Consider this fair warning: The ski area's only beginner terrain is off the Eagle’s Rest double chair and the high-speed quad Teewinot lift next to the gondola in the base area. Together, the two lifts make for a nice learner’s area. Once you’re beyond beginner, you’ll most likely find it boring, although the resort does a great job of cutting tracks into the woods between the wide-open runs. Once you’re an intermediate skier, you have quite a few choices at JHMR. If you don’t want to worry about having to pay particular attention to a trail map (and perhaps ending up above a cliff), Apres Vous Mountain is your best bet. The smaller and less cliffy of the resort’s two mountains is serviced by a high-speed quad from the top of the Teewinot lift and, heading skier’s right from the top of the lift, has an array of groomed intermediate runs stretching its entire face. The easiest intermediate runs on the mountain, which are still a big jump in difficulty for those coming from skiing the resort’s green runs, are off the Casper Bowl Triple Chair. Easy Does It, Lift Line and Camp Ground are the most mellow runs off this lift. Horn’s Hole Traverse to Amphitheater from the top of the high-speed quad Thunder Chair is another of the resort’s more mellow intermediate runs. The Bridger Gondola accesses a lot of intermediate groomers, but they are substantially steeper than the runs mentioned off Casper and Thunder. Gondola intermediates are generally moderately steeper than the intermediate runs off the Apres Vous lift. Corbet’s Couloir might be the resort’s most famous run, but the fresh waffles topped with everything from Nutella to strawberries served up at Corbet’s Cabin are worthy of some serious contemplation, too. Have one before heading over to Corbett’s. 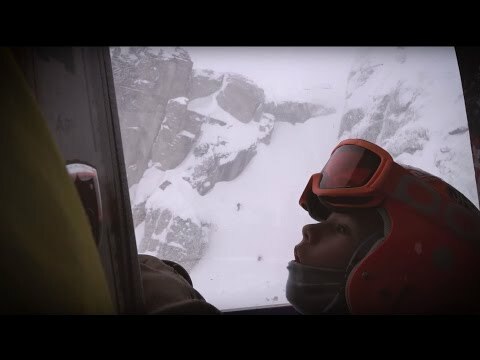 The mandatory air to get into the famous couloir is less intimidating on a full stomach. With lessons for all ages and abilities, JHMR’s Mountain Sports School is awesome. Adults signing up for group lessons at intermediate levels and higher often end up with a semi-private lesson. Under the Mangy Moose, the Rocky Mountain Oyster Café serves 1/4-pound grass-fed, antibiotic- and hormone-free beef burgers starting at $4.50. A buffalo burger is $6.50. The Snake River Lodge & Spa allows spa day guests to use its pool and outdoor hot tub, which might just be Teton Village's best. The Four Seasons pool is one to plunge into as well, but the only way you can use it is if you’re an overnight guest at the property. If you can tear yourself away from the mountain for a day off, Grand Teton National Park is literally right next to JHMR. Yellowstone National Park is about an hour away, and numerous outfitters in Jackson offer day-long snowmobile trips to Old Faithful, which is a much less touristy in winter. Few resorts in the country can compete with JHMR. Twelve miles away, Snow King Resort is smart enough not to try. Jackson’s “town hill,” Snow King is still a local’s favorite. It offers two-hour lift tickets, night skiing, 1,500-feet of vertical, a tubing park and, from both mid-mountain and the summit, fantastic views of the Tetons. It is north facing so usually pretty chilly. Back at JHMR, the best views of Corbet’s Couloir—other than those heart-pounding looks you get standing at its lip—are from the southern deck at Couloir atop the Bridger Gondola. If you’re staying in Jackson and driving out to the Village, a short detour to Nora’s Fish Creek Inn in Wilson at the base of Teton Pass is eminently worthwhile. In a cozy log cabin with a Tulakivi wood-burning stove, Nora’s has everything from Banana Bread French Toast to a number of egg concoctions on the menu. There’s usually a wait for a table–and everyone who walks in the door is subject to the same wait, even the occasional celebrity (David Letterman, Jimmy Carter, Bill Clinton, Harrison Ford)–but seats at the U-shaped bar turn over fairly quickly. JHMR’s on-mountain dining scene was one of the last things at the resort to go fancy. One look at the cupcakes and rice crispy treats the size of your face, the sky-high sandwiches, and Salt-baked Idaho Potato bar at Rendezvous at the top of the gondola, and you’ll agree it was worth the wait. The Casper Restaurant has fewer choices, but the roaring open stone fireplace more than makes up for it. If your legs are aching to take a break from the mountain, Teton Thai is, without a doubt, the valley’s best Thai food. Formerly hidden in a side alley just off Jackson’s Town Square, Teton Thai has moved into a new building next to the $5 parking lot at the Village. From the base area, it’s a five-minute walk, or you can hitch a ride on one of JHMR’s big red buses constantly shuttling between the base area and the lot. You can’t really go wrong with anything here, although expect prices to be a couple of dollars more than you’d pay at a Thai place back home. For nights when price isn’t an issue, Couloir, (307-739-2675) the fine dining restaurant at 9,065 feet atop the gondola, is hard to beat. Plus, any meal that requires a gondola gets some serious cool points. Couloir could stop there, but it doesn’t. Its four-course prix-fixe menu includes some of the best dishes in town: Tenderloin of Buffalo; Pan-Seared Hudson Valley Foie Gras; Spicy Grilled Ono with Coriander. Desserts come from one of the valley’s best pastry chefs. Back down in Teton Village, Il Villaggio Osteria (or just Osteria) inside Hotel Terra, has a very different vibe -- more hip than haute -- and what might very possibly be the world’s best boar ravioli. The pizzas, cooked to order in a wood-fired oven, are pretty close to perfect. The fried olives stuffed with housemade sausage are out-of-this-world good. Located between Teton Village and Jackson on the Moose Wilson Road, Q Roadhouse has the most sophisticated menu of any roadhouse we’ve ever seen: ginger lime salad, grilled South Carolina quail, quinoa not-so meatloaf (sauteed kale, green beans, smoked tomato and chipotle sauce), and sweet tea brined chicken fried chicken. In Jackson, locals love the casual option Snake River Brewery (aka “the Brew Pub”). The Brew Pub has at least seven of its award-winning beers on tap at all times and the portions of everything – but especially the pastas – are huge. Around since 1967, the Mangy Moose is the classic Teton Village apres ski scene. It qualifies as a Village institution at this point, and the giant plate of nachos definitely qualifies as an institution. While the 20-something ski bums like the Moose’s cheap pitchers, vacationers appreciate the extensive top shelf liquors, the skilled bartenders, and the quality live music (Medeski, Martin & Wood, G. Love and Special Sauce, Maceo Parker, Blues Traveler, Reverend Horton Heat, and Martin Sexton have all played at the Moose). Families and those who prefer the soothing sounds of a live pianist to the press of the crowds often at the Moose might want to head to the Four Seasons Lounge instead. The soothing space – not to mention its sushi and sake menu – can’t help but relax. In Wilson, the Stagecoach Bar is the place to be Thursday nights and Sunday Night. Every Thursday, the ‘Coach channels the 70s, drawing most every 20-something in the valley to its dance floor, with Disco Night. Sunday nights are a completely different crowd. The Stagecoach Band takes the stage with its mix of swing, country, western, and anything else it pleases. Smack on the Town Square in Jackson under bright neon lights, you’d never call The Million Dollar Cowboy Saloon a ski bar, but it is a classic valley watering hole and has live music a couple of times a week. It’s also got some of the best people watching around: real and wanna-be cowboys mingle with co-eds, the occasionally Hollywood star, and the valley’s best western swing dancers. Sadly, you have to do your people watching from a saddle. There are no normal bar stools here. 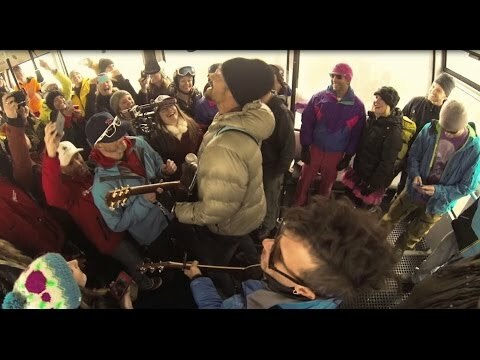 Michael Franti live from the Jackson Hole tram.